Hispanic American civil rights activist and author Throughout her career Hispanic American civil rights activist Linda Chavez has helped change the role of Hispanics in America. Chavez believes that Hispanics and other minorities should be awarded advancement not because of their race but rather for their own achievements. Linda Chavez was born into a middle-class family in Albuquerque, New Mexico, on June 17, 1947. Her parents, both devoted Catholics, came from different racial backgrounds. Her mother was Anglo American and her father was Hispanic. Racial prejudice was not a concern during her early years as the city of Albuquerque was mostly Hispanic. Her father was proud of his heritage as a descendant of seventeenth-century Spanish settlers and also took pride in the United States. He served as an American during World War II (1941–45). Chavez's father considered his Hispanic background part of private life, not public. Her father's quiet approach to his racial identity was influential in Chavez's own ideas later in her career. Chavez first came into contact with racial prejudice when her family moved to Denver, Colorado, when she was nine. Chavez witnessed firsthand the negative attitudes about minorities that would later inspire her to join in civil rights movements supporting the causes of Hispanics, African Americans, and women. She also became determined to excel in her schoolwork to overcome the low expectations that some people had of her as a Hispanic. After graduating from high school, Chavez attended the University of Colorado, where she decided to pursue a career in teaching—a career that she felt could play an important role in social reform. During her undergraduate studies, she married Christopher Gersten in 1967, but she kept her maiden name. After graduating from the University of Colorado in 1970, Chavez went on to the University of California at Los Angeles (UCLA), where she began a graduate program in English literature. However, she became upset with the way she was treated by faculty and students because she was Hispanic. Chavez left the university in 1972 and moved to Washington, D.C., with her husband. In the nation's capital, Chavez did not return to teaching but remained active in educational issues. She worked with the National Education Association (NEA), the largest teachers' union in the country. She served as a consultant (someone who gives expert advice) on education to the federal government's Department of Health, Education, and Welfare. In addition, she became an active member of the Democratic National Committee, participating in the promotion of a number of liberal causes. She eventually obtained a position with the nation's second-largest teachers' union, the American Federation of Teachers (AFT), which was known as an influential force in education policy. While editor of the AFT publication, American Educator, Chavez wrote a series of articles urging a return to "traditional values" in American schools. These writings soon brought her to the attention of conservatives in Washington. Throughout the 1970s Chavez became increasingly dissatisfied with liberal views on minorities in America. She felt that liberals sought her out simply because of her representation as a Hispanic leader, not for her own ideas. Similarly, she developed a growing concern over national programs such as affirmative action (efforts to create equal opportunities for minorities and women in areas such as education and employment). Chavez believed that Hispanics should not be stereotyped, or forced into traditional roles, as helpless minorities who could not get ahead without government aid. 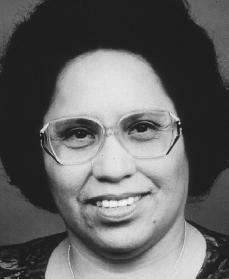 She believed Hispanics should be encouraged to succeed through individual effort. With the election of Ronald Reagan (1911–) to the presidency in 1980, Chavez's ideas received praise from conservatives. She became a consultant for the Reagan administration in 1981. In 1983 she was appointed by the president to serve as director of the U.S. Commission on Civil Rights. Chavez continued to criticize certain parts of the country's civil rights laws, especially programs such as affirmative action. Meanwhile, many liberal activists accused her of supporting Republican efforts to weaken the government's role in guaranteeing civil rights to minorities. Finding herself lacking support from most Democrats, Chavez officially joined the Republican Party after being hired onto Reagan's White House staff in 1985. As director of the Office of the White House Public Liaison, Chavez was the most powerful woman on the staff. Her position gave her an increased level of influence with the president, but she left this post after less than a year's time in order to run for senator in Maryland. For the senatorial race, Chavez ran as a Republican in a mostly Democratic state. The state's citizens were distrustful of Chavez's short residence in Maryland as well as her track record in her shifting political beliefs. On election day, Chavez was handed a devastating defeat. Soon afterwards, she removed herself from the political arena. Now free of political loyalties, Chavez returned to producing ideas for social and educational change. The Manhattan Institute for Policy Research, a conservative research institute, made her a fellow (an associate). She also became a regular contributor to many national publications. Her 1991 book, Out of the Barrio: Toward a New Politics of Hispanic Assimilation, brought renewed attention from politicians and the press. The work once again showed her belief that affirmative action and other programs created an unrealistic and unflattering picture of Hispanics as a group. As had been the case throughout her career, Chavez's words were often talked about in the media, but they created debate and raised awareness about the state of the nation's attitude toward minorities. In 1995 she founded the Center for Equal Opportunity in Washington, D.C., a public policy organization that concentrates on three subjects: racial preferences, immigration and integration, and multicultural education. In 2000 Chavez was honored by the Library of Congress as a "Living Legend" for her continued involvement and contributions to American culture. In 2001 the newly elected President George W. Bush (1946–) nominated Chavez for Secretary of Labor. Chavez later withdrew her name from consideration. It is believed that she did so because of media allegations that she had housed an undocumented immigrant in her home, which is against the law in the United States. Despite the criticism she has received from many liberal and Hispanic American groups for her conservative views, Chavez has emerged as one of the most visible and influential figures fighting for civil rights and educational reforms. Her example as a successful political personality has made her a role model for many in the Hispanic community, inspiring a growing number of politicians in the minority group to join the Republican Party. Chavez, Linda. Out of the Barrio: Toward a New Politics of Hispanic Assimilation. New York: Basic Books, 1991. Telgen, Diane, and Jim Kamp, eds. Notable Hispanic American Women. Detroit: Gale, 1993. The photo above is of Linda Chavez Thompson who was born August 3, 1944. She is not the Linda Chavez born in June 17, 1947 that you are supposted to be writing about. My last e-mail thought that Linda Chavez had plastic surgury. It is just that you place the wrong picture on this site. No, Hispanics don't all look alike.